Monica Anderson is CTO and co-founder of Sensai Corporation and founder of Syntience Inc. Here she discusses Dual Process Theory, The Frame Problem, and some consequences of these for AI research. Dual Process Theory is the idea that the human mind has two disparate modes of thinking - Subconscious Intuitive Understanding on one hand and Conscious Logical Reasoning on the other. The Frame Problem is the idea that we cannot make comprehensive Models of the World because the world changes behind our backs and any Model we make is immediately obsolete. The conclusion is that AI research since the 1950s has been trying to solve the wrong problem - one that is much harder than necessary. She also introduces Model Free Methods as an alternative path to AI, capable of sidestepping the Frame Problem. 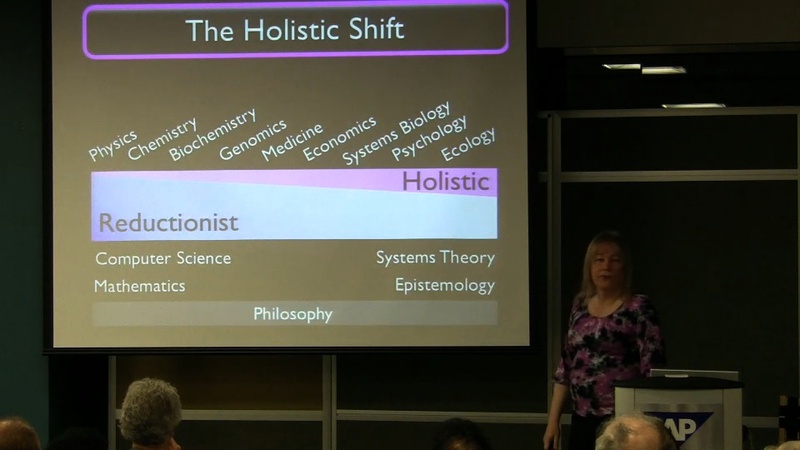 Monica Anderson discusses the ongoing paradigm shift - the "Holistic Shift" - which started in the life sciences and is spreading to the remaining disciplines. Model Free Methods (also known as Holistic Methods) are an increasingly common approach used on "the remaining hard problems", including problems in the domain of "AI" - Problems that require intelligence. She illustrates this using a Model Free approach to the NetFlix Challenge. Her website provides some background information. Ms. Anderson ran the Bay Area AI Meetup for over five years; about 115 MeetUps were held. Currently these meetaups are on hiatus - she is looking for a sponsor with a venue capable of holding about 200 people. Most AI meetups featured a presentation by a group member or by an invited speaker. This was typically followed by a discussion that centered on the presentation but would often expand to any AI related topic. Several more of these meetups have been video recorded and will be made accessible through this page as they finish postproduction. Holistic Salons are a series of AI MeetUps featuring talks by Monica Anderson about her research (especially Artificial Intuition) and its philosophical foundations. Initially these were held salon-style in her home but as their popularity grew they were made part of the AI MeetUps. Monica Anderson proposes adding a new target to ongoing AI research efforts: We need to focus more of our attention on Understanding as opposed to Reasoning. Understanding requires using Model Free Methods. As a bonus towards the end, Ms. Anderson also speculates about the so-called AI singularity and discusses whether SkyNet like scenarios, where computers take over the world, are plausible. Computer based analysis of the Semantics of language expressed as text is an AI level problem. Existing methods almost universally use Models of Language (Dictionaries, Grammars, Word Nets, Taxonomies, and Ontologies). The two simplest and most pervasive Models claim that Languages have Words and that those Words have Meanings. While acknowledging that good alternatives do not yet exist, this talk attempts to make plausible that these two "obvious" but fatally incorrect Models result, automatically, in a cascading series of forced engineering decisions that each discard a fraction of the available semantics until we end up with brittle systems that fail in catastrophic and memorable ways. The proposed alternative to word-centric Model Based methods of language analysis is Understanding Machines - capable of learning languages the way humans learn languages in babyhood - using new classes of algorithms based on Model Free Methods. In so-called "Bizarre Domains", Models of the target problem domain cannot be used. Models include Scientific Models, Naive models, theories, hypotheses, formulas, equations, and computer programs. Model Free Methods are simpler than Model Based Methods and work everywhere including in Bizarre Domains. Our everyday mundane reality - where AIs supposedly have to operate - happens to be a Bizarre Domain. Therefore, AI researchers need to treat AI as a Life Science and only use Model Free Methods (which are common in Life Sciences). This video provides a brief introduction to Model Free Methods followed by an interactive workshop where four problem and their solutions are discussed. For each problem, we discuss first a Model Based and then a Model Free approach. Note that while the Life Sciences often use mixes of both kinds of methods, in the case of AI we need to only use Model Free Methods. Reductionist methods have failed and will always fail on problems in "Bizarre Domains" - domains where Reductionist models cannot be created or used. Examples include modeling significant parts of the world we live in, many problems in the Life Sciences, analyzing organisms including human physiology, drug interactions, etc., the global economy and stock markets, analyzing the brain, creating an Artificial General Intelligence (AGI), and the semantics of text. This video attempts to clarify the distinction between Reductionist Models and Holistic Patterns - central concepts in Monica Anderson's theory about "Artificial Intuition". Reductionist Models cannot be created or used in Bizarre Domains, but Model Free Methods can be used everywhere. The initial part of this talk repeats some introductory material from the first tak above; the new material starts around 8:50. Dr. Peter Norvig is Director of Research at Google Inc. He is a Fellow of the Association for Computing Machinery and the American Association for Artificial Intelligence and co-author of Artificial Intelligence: A Modern Approach, the leading textbook in the field. Previously he was head of Computational Sciences at NASA and a faculty member at USC and Berkeley. In this talk he discusses, among other things, how non-parametric models can be applied to vision and language problems in data-rich environments. Jamais Cascio writes at OpenTheFuture.com about the intersection of emerging technologies, environmental dilemmas, and cultural transformation, specializing in the design and creation of plausible scenarios of the future. His work focuses on the importance of long-term, systemic thinking, emphasizing the power of openness, transparency and flexibility as catalysts for building a more resilient society. Bob Blum, MD, PhD examines consciousness and the four basic questions: What is the definition of consciousness? Who is conscious? When did it evolve? And Why did it evolve? These video recordings are sponsored by Syntience Inc. Recordings Copyright © 2008, 2009, 2010 Syntience Inc. Presentations copyright their respective presenters.